How to become a youth friendly city? Being a student of finance and co-founder of the Municipal Youth Council of Thessaloniki, Zafiris Sidiropoulos knows a lot about the challenges that young people in Greece are facing. The young youth worker shared his point of view during the Fishbowl discussion at the 3rdGerman-Greek Youthforum in Cologne an talked to Yasmin Janclaes about his vision. Agorayouth: Which topics do you want to support by working for a youth organization? 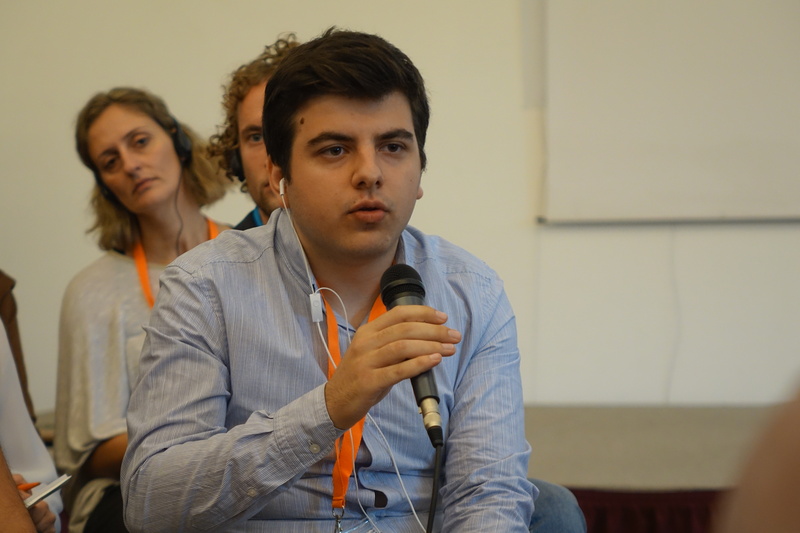 Zafiris Sidiropoulos: My topics are active citizenship education and participatory tools for youth friendly cities. How does your organization, the Network of Youth Engagement of Katerini, support the participation of young people in local politics? At the moment we are running two or three major projects. The project in my hometown, the Sinthese (ΣΥΝΘΕΣΗ) City Council Model of Katerini, is a simulation that gives 41 young people the chance to play the role oft the municipal chancellor and understand the importance of decision making in local process. At the same time – and this is the project that I’m involved in – there is the City Youth Council of Thessaloniki, which is a form of political participation in local issues. The project gives 98 youngsters from Thessaloniki the opportunity to participate and co-decide on youth polls and local issues. I‘m also involved in the participatory budgeting for Youth in Thessaloniki. By this project young people can allocate public money of the municipality that is related to youth activities. They can vote for different projects for the local communities and the municipality will fund them. In your opinion, what are the biggest challenges for young people in Greece? Often young people don’t have specific steps planned for their future and some are feeling inconvenient with this status. Many of them are unemployed or they have a job that is unrelated to their graduation. Some are going abroad to seek for a better future. In all of these cases, young Greeks are feeling insecure about their future. They have the feeling that the European Union is not doing anything for them, that their parents lived a better life than the ones they will live and that they are not receiving enough help neither by the state, nor by their local community or the educational system. This is a challenge for exchange programs as well. How can they contribute to strengthen youth and their participation? Many German cities have similar forms of participation as the City Council of Thessaloniki. But those programms are quite new for the Greek environment. It would be great to have an exchange of good practices between the Thessaloniki City Council and other German cities who have the knowhow and ways to measure the impact of such participation models. For an exchange it is important for us to share knowledge, to network and also to acquain ideas to improve the procedures in Thessaloniki. How can mobility be encouraged for young people? The youth community can only be encouraged on the basis that the Greek-German Youth Office will provide mobility opportunities to those young people that don’t already have time, money and knowledge at hand to go abroad. I think that the discussion on mobility for young people reaches a very limited amount of Greeks not the whole youth community. You are talking about young people with less money, less chances or a lower level of education. How can they be reached by the programmes? I think you have to reach young people in their local environment – that job should be done by municipalities. I strongly believe that they should have an important role in promoting opportunities to young people because they communicate with them in their daily lives, for example in school. By this young people could gain „ownership“, which means the feeling that there is something they belong to. And as well that they will be provided with tools by the state that they didn’t have before. During the Fishbowl discussion you said, that you cannot imagine what your life will look like in ten years but that you’re looking in the future full of hope. Where do you collect your positivity? (laughs) Actually I’m not a very optimictic person at all. But during the last two or three years many things happened that changed my mindset a bit: I understood from my experience, that if you work a lot with energy, passion and knowledge and if you really want to change something and put your energy in this, good things are going to happen. I’m not sure that I will continue my activities in the field of youth work in the future. Perhaps I will seek for a permanent job related with my studies. But I think I will continue it as a hobby because I believe that you can really have a strong impact if you bring in your energy and passion and do not only aim to earn money or do something for a living. Do you think most young people in Greece and Europe share this positivity for their future? Of course many young people are facing difficulties in their lives. This is why we are here at the Youthforum. I think the most important thing is information management and how information flows from the decision makers to the youth community. As young people are supported, they will understand that the tools they are provided with provide them with opportunities, knowhow and experiences. So yes, they will think positive as well. Concerning the European Union, how would you describe the attitude of young people in Greece towards it? In 2015 when Greece had the referendum for staying in Europe or leaving the EU – the real question of the referendum – young people were adverse for Europe, because they had lived all their lives inside Europe and European Union. They were feeling that they had not been priviledged by the European Union and didn’t felt as European citizens. They wanted to be out of the European Union because they couldn’t understand the meaning of a united Europe. Three years later I’m not sure if young people in Greece are feeling as Europeans or are sharing the European values, but I think that they cannot imagine their lives outside the European Union. One personal question: What do you hope to gain from the German-Greek Youth Forum? I came here to see the specific priorities and to get knowledge about the next year of the German-Greek Youth programmes. At the same time I want to contribute with my ideas and my knowledge for specific projects to establish such forms in other bilateral projects – especially those that have to do with participatory mechanisms and that put young people in the decision making process. These projects really can have an impact on Greek-German youth exchanges.